Teams will receive notice of the first launch site a few weeks prior to launch and exact details on the payload and intended orbit just days before launch. DARPA is targeting both launches for early 2020. 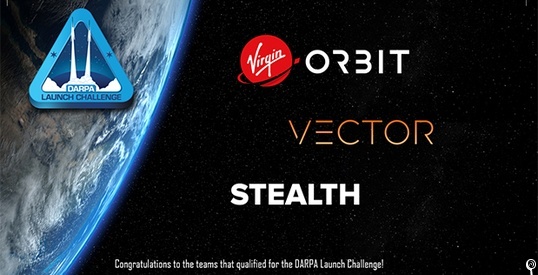 The qualifying competitors are Vector Launch; Virgin Orbit, which entered the competition via its wholly owned subsidiary, VOX Space; and a third company, which has requested anonymity for the first few months of the Challenge. DARPA awarded a $400,000 prize to each competitor that completed the qualification phase, which included submission and acceptance of a Federal Aviation Administration (FAA) commercial launch license application. The DARPA Launch Challenge aims to fundamentally shift military space capabilities to enable on-demand, flexible, and responsive launch of small payloads. Teams will receive a $2 million prize for successfully delivering payloads to orbit in the first launch. For a successful second launch, prizes of $10 million, $9 million, and $8 million are available for the top three teams respectively, ranked by factors including mass, time to orbit, and orbit accuracy.